• analyzing primary and secondary source materials. • proving generalizations to be true. 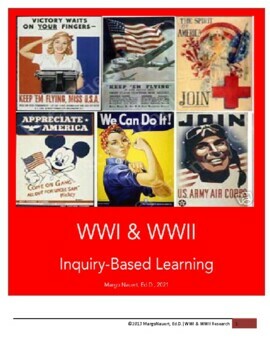 The 15 research prompts are tested and proven to be rigorous research opportunities that will accompany any middle or high school unit on WWI and WWII. The higher-level requirements for research and synthesis of information make it an excellent resource for teachers of gifted and talented students in earlier middle school. However, the prompts are still grade and age appropriate for high school as well. Included in the file is a standards-based rubric to assist in grading projects and research. These Research Prompts meet rigorous demands and are aligned to the Common Core Standards. CCSS.ELA-Literacy.RI.6.6 Determine an author’s point of view or purpose in a text and explain how it is conveyed in the text. CCSS.ELA-Literacy.RI.6.8 Trace and evaluate the argument and specific claims in a text, distinguishing claims that are supported by reasons and evidence from claims that are not.